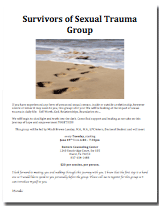 Restore Counseling Center is not currently offering a new group however here are some good resources. We will begin to shed light and truth into the dark. Come find support and healing as we take on this journey of hope and empowerment TOGETHER!